Paul Berdell, a consultant helping dairy producers transition to robotic milking, has more than a decade of experience with robots. 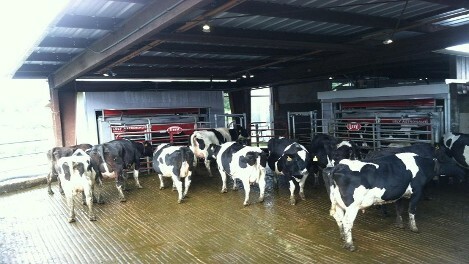 He recently wrote an article in Progressive Dairyman about converting tiestall herd to robotic milking. Read an excerpt below or the entire article here. A robotic transition often pushes the cow and dairy producer to the edge until after a while they both are used to the new style of milking and management. The ultimate question as a producer with tiestalls is: Do you really want to add all of the new facility stresses on the cow at the same time you’re adding new milking stresses? Your answer should be no. The best way to ensure that you are not adding undue stress to your cows during startup is to plan ahead. Make your timeline work so you can train your cows to the facility first, before the startup of the robot. Often in tiestall transitions, producers think that this is impossible to do, but I believe in many cases by planning months in advance, it can work. And I encourage tiestall producers to make every effort to do it because one of the biggest milk losses in tiestall transitions comes from cows not adapting to the freestall barn. If you’re thinking about building now, then you should have your calendar out to plan the timeline, too. Instead of looking at the barn construction and robot delivery timeline, look at the best cow timeline. When can the barn get done? How long can I wait before I absolutely must start the robot? Can I figure out a way to delay the robot and milk in the new barn or in a mix of both new and old facilities? What do I need to have? Who do I need to help out?